When I first started in photography, digital was really in it’s infancy. The cost for digital equipment was sky high, and the quality was a far cry from what there is today. I was using point-and-shoot film cameras that produced better results. Then, I picked up the film SLR and started learning more of the technical aspects of capturing light. Well, I just chuckle when I think back to some of the hassles of film. A roll of film was in the camera for however many shots it could hold – those 24 exposure rolls! 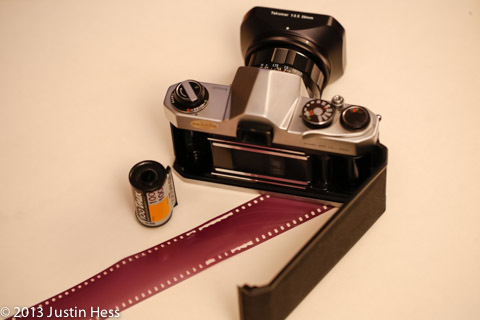 The film speed [ASA # – now ISO] could not be adjusted until the whole roll was changed. Then, there was the process of getting the film developed to even see how the images turned out. Even with a point-and-shoot film camera, there could be photos that did not turn out. I still use the film SLR that I used during my first photography class. I finished a roll of film tonight and tried to rewind it. It got stuck in the camera, and I was unable to do anything about it. I opened the back of the camera, which ruined the entire roll of film. When I think about the digital era, there are many of the same problems as with the film era. Granted, some things have changed. There is a little bit more adaptability built into the equipment. Sensor output can be boosted on the fly, effectively changing the ISO. Focus is much faster and, a lot of times, automatic. A memory card can hold thousands of photos. Files can be instantly processed in camera or on a computer to be viewed on digital displays or for printing. However, pictures can still be lost, just like a roll of film getting stuck in the camera. A one time shot may be missed because of incorrect camera settings. There can be errors in processing. Yes, even with film, a photo could be “photoshopped.” I actually don’t like the term “photoshopped.” A “photoshopped” photo implies that the photo is not a representation of the actual scene. I prefer post-processed. A post-processed photo implies that the image has been processed from it’s RAW format into a displayable version. This is equivalent to the dark room where film was processed from a [RAW] state shown in the photo below into a displayable image. What was on that roll of film can never be recovered. I have quite a few [RAW] digital files with the same problem of never being able to recover them to a state of being a displayable image. In a lot of ways, there was more finesse with film. A photographer really did have to know the equipment in order to capture the light properly. The limitations of film made a photographer more aware of trying to get that one perfect shot. Not just that one, but hopefully every single shot. When they took the film out of the camera to process it, there was a fifty percent chance that there was going to be a displayable image. With digital, people just click through as many photos in a split second as possible and hope they can pick the best one out of the thousands. There is no real sense of making it perfect, it’s just making sure it’s displayable ASAP. What has changed? When comparing the two eras – not much! The art of capturing, processing and displaying a photo is really the same. The same problems can be encountered.